Keyword - Parker Brothers' answer to Scrabble. 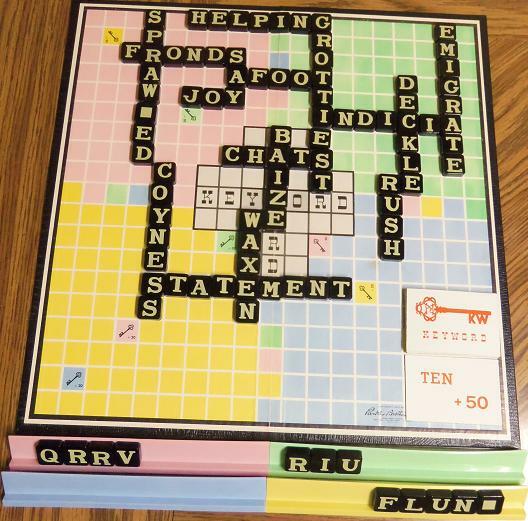 Please visit the Scrabble For Word Lovers introduction page. Some house rules and fixes? Maybe you've noticed I'm a Scrabble fan? My main bag is generating interest in Scrabble rehabilitated as the world's most intelligent and exciting, vocabulary-based, big, healthy word game, as opposed to the modern "strategy" game based on the smallest, strangest words in the language. See the links at the very top of this page. But I've also gotten caught up in the exciting early history of Scrabble. 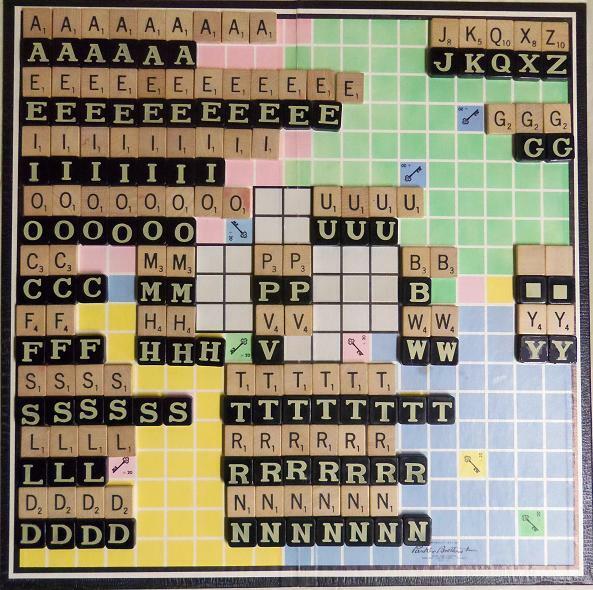 This led me to Anex-A-Gram, a Scrabble-like game predating Scrabble by ten years(! ), and Crossword Anagrams, which was Anex-A-Gram slightly modified by its makers to make it even more Scrabble-like in the hopes of cashing in on Scrabble's phenomenal success in 1953. Anex-A-Gram and Crossword Anagrams seem to have had very limited success, based on their scanty mentions on the internet and rare appearances on ebay. 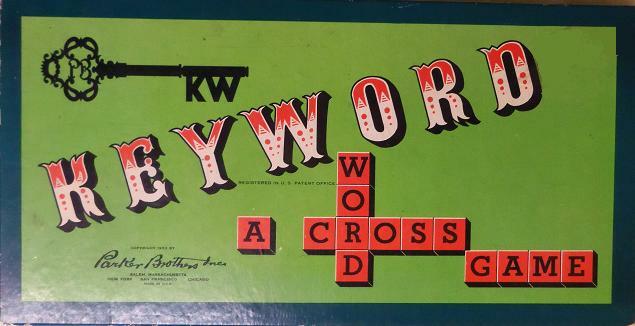 On the other hand, Parker Brothers' rival to Scrabble, called Keyword, is all over the place. Which isn't to say that anyone has written up any expansive thoughts on the game. Hey, while you're here, maybe I'll give it a go! Scrabble's success must have galvanized Parker Brothers into immediate action; Keyword shows a 1953 copyright. It seems to have been quite popular, in both the U.S. and U.K., lasting at least through the 1950s. Parker Brothers changed the graphic artwork several times, and went through a variety of tile and rack designs. They offered basic and deluxe editions. LIFE Magazine showed my set in an edition around Christmastime 1955. Here's the 19x19 Keyword board. That's like a Scrabble board with two extra rows all around. (Very nice for big word lovers!) The fine print on each Key Square says "+ 20". Don't let the board intimidate you; the rules and strategy are instantly graspable, as we'll see below. But if you're wondering about the four quadrants of different colors, I'll say that a color square acts as a "double letter score" for the player of that color. So in Keyword every player has his own great, big pool of double letter scores! A Scrabble player might wonder, "How on earth could that work???" Perfectly well, you'll see. Here are the 96 Keyword letter tiles. I've laid them out intertwined with a standard set of Scrabble tiles so you can compare the frequency of each letter at a glance. 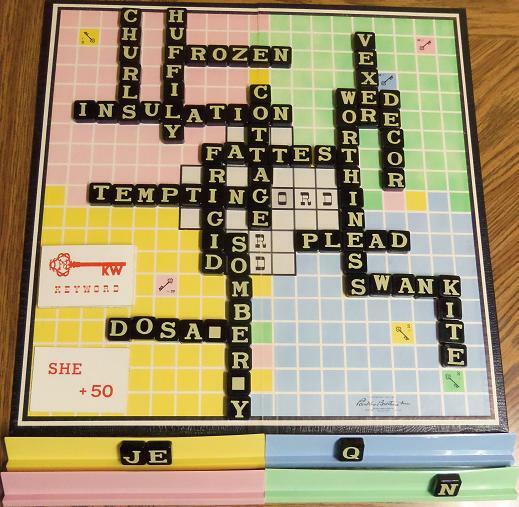 as compared to the standard Scrabble set. Sorry about the upside-down H.
I hope the non-alphabetic layout doesn't throw you for a loop. I think of Scrabble tiles in families: the vowels; the nice quadruplets spelling SLeD; the nicer sextuplets spelling TRaiN; the spunky 3-point twins spelling CaMPBeLL(using the bLLanks); the grouchy 4-point twins spelling FHVWY (huh? ); the big gun singletons (JKQXZ); and the only triplet (G). 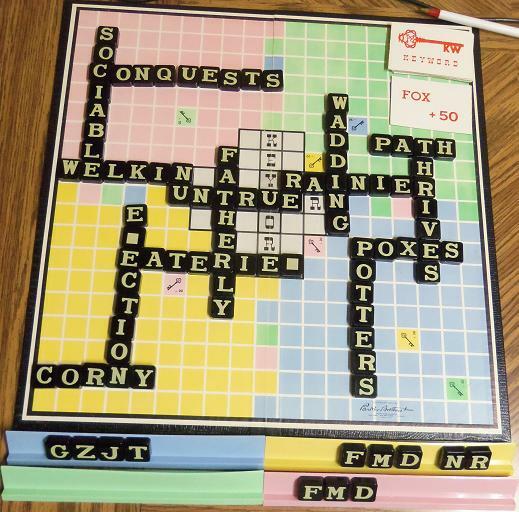 For fun, visit my Counting Scrabble Tiles page sometime. Here are the precise numbers. It seems that the British edition had a slightly different letter distribution. Someone reported seeing sets with 2B and 2C (not 3C); I've seen a set with 2B and 5S (not 6S). Notice the color coordination with the board. If you are Yellow, say, it will be good to land on yellow squares. This rack design is annoyingly insubstantial, three of them weighing little more than one Scrabble rack, and barely long enough to hold the 10 Keyword tiles, never mind provide room for shuffling. And there's a hefty reward for putting aside your quest for big, satisfying words, if you can, to play the little 3-letter "keyword" currently showing. For the record, the 12 keywords in my set are: AGE CAT DIG FOX MAP PIN RUN SHE TEN THE TOP YOU. Deviations have been reported. Keyword is just a Scrabble variant, so if you're familiar with Scrabble word formation and scoring, you're almost ready to go. 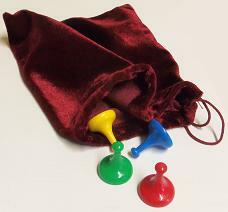 There are four colors, Red Yellow Green Blue, and each player chooses a color. We'll use Green as our example. Suppose you're Green and you play your word. A tile that falls on a plain green square scores 10 points. A tile that falls on a non-green Key Square scores 25 points. A tile that falls on a green Key Square scores 50 points. Keyword also has an extra twist -- from which it gets its name -- where a 3-letter "keyword" card is turned face up, and a player who forms that word gets a 50-point bonus. If you go out, you are rewarded with 5 points for each tile left in the other players' racks. On top of that, you get 50 points. Not now, but for reference, here are the complete 1954 Keyword rules in pdf. Here are our first four, 4-person Keyword games. They were played totally honestly, meaning, each "color" doing his darndest to win. Great game! The bonus system works! Look at those nice, big, healthy words, and consider that they were played in the service of racking up filthy, vulgar, arbitrary points. Almost every play (call it 48 out of 58) cashed in on a Keyword bonus, meaning the word landed mostly on squares of the desired color, and/or hit a Key Square. 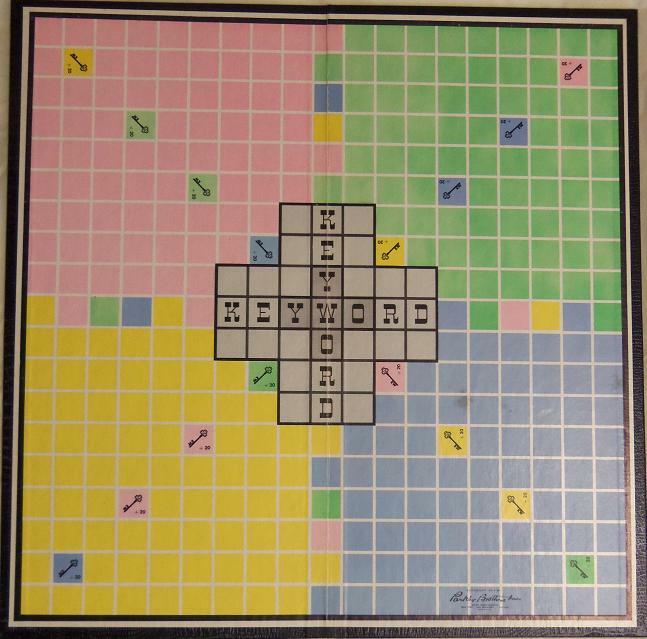 That can't be obvious looking at the Keyword board, with not even a quarter devoted to any color, and with its paucity of Key Squares -- just 16 out of 361 squares. In a nutshell, Keyword is a word game and a strategy game all rolled into one. I tip my hat to the Parker Brothers team. It's kind of funny to imagine the scene in the Parker Brothers war room back in 1953. "All right, men, your mission is to come up with a Scrabble that's not a Scrabble. NOW!" A minor concern is that the player who went out won every time, coming from 2nd, 3rd or 4th place to blow-out wins of 80, 75, 85, and 90 points. And it looks as if there's a slight disadvantage to going first. Player 1 doesn't really have anything to shoot for, while opening up the floodgates for everybody who follows. And if he plays more than 3 tiles, he sets up an easy shot at two Key Squares, which would yield 50 or 75 bonus points right there. That explains the walloping plays, FATTEST=95, CHATS=85 and FATHERLY=85, you see above. I mentioned the heavy shift towards consonants in Keyword, as compared with the Scrabble letter distribution. Consonants are much more fun to work with, so I'm happy with that. But you can see the consonant heaviness in the leftover tiles: 34 unplayed consonants to just 4 vowels! Which reminds me, in Keyword, the JQXZ are inveterate baddies. (And lookie there, just three U's for the Q now!) So modern Scrabble players be forewarned, no buckets of mindless JQXZ points showering down like manna from heaven! Without a moment of hesitation or indecision: SWAP FOR THE BLANK if you have a letter in your rack for which a blank on the board is standing. I say it loud, I say it proud: We played all the games you see here with "swap for the blank!" You score for all the letters in your main word, not just the letters you played. Each letter that was already in place scores its base 5 points. This isn't simply a nod to Scrabble; it's only proper that you be rewarded for the whole of the word you came up with, no matter where the tiles came from. It also makes "stretch plays" (such as worthINESS and failURE in the games here) more worth considering. I don't see any reason why the first word must be played with the first 3 letters covering the YWO spaces. (You'll notice we were ignorant of that in our games.) Maybe Player 1 wants to get "good" letters on the border of his own quadrant; or "bad" letters on the boundary line of his opponents' quadrants. And I really, really don't see any reason for the constraints on using the S. I say, anything goeS! A brainstorm regarding the 3-letter keyword! If you can form the keyword, you may make any other play and receive either the score of that play, or the score of the keyword play, whichever is greater. Now you don't have to throw strategy (and self respect) out the window, or mess up the board, to collect your reward. You might use such a turn to play off some troublesome letters, for example. These games were all 4-person games. But what about two- or three-person games, with whole quadrants sitting there with no mommy or daddy? 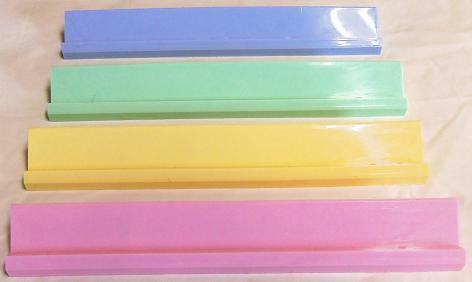 My idea is that on every turn, after replenishing your rack, you also randomly draw your assigned color for your next turn. You can figure out a way to do that with cards, chips, or rolling a die, say, but I found a friendly, fitting solution: Sorry pieces (red! yellow! green! blue!) in a bag. You will draw a color after every turn, even after the tile bag is empty. Ditch the 50-point going out bonus? Certainly in Keyword tournament play (haha). But I've noticed that for a lot of recreational Scrabble players, the thrill of going out is almost the main thing, and I have no objection to a game where going out gives a major final boost to the happy player who manages it. Do you see what I see? Big words! If Keyword had won out over Scrabble, I'd have been spared a 30-year (and counting) crusade on behalf of the world's word lovers. The average length of all 68 words you see on the final boards is 6.0 letters. Ignoring the 10 short connector words (which don't count in scoring), the average length is 6.6 letters. In comparison, the words on the boards of the 5-game playoff at the 2015 North American Scrabble Championship averaged a mere 3.7 letters. How can that be, ordinary brains leaving the best Scrabble brains on earth in the dust in word formation? There are reasons, of course. 1. Keyword has a 10-tile rack versus Scrabble's 7-tile rack. 2. Keyword has an enlarged, 19x19 board. 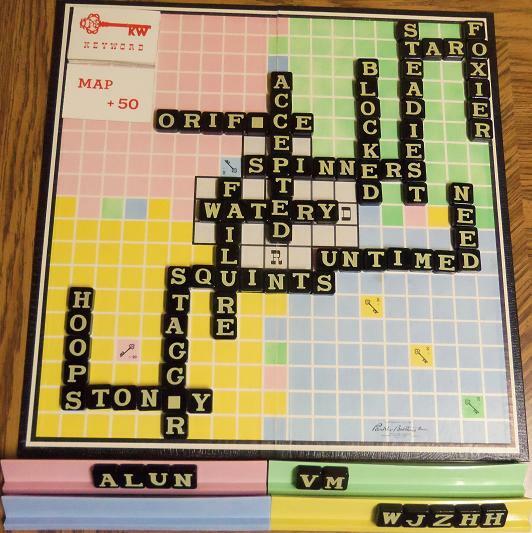 Look back at the 4 games; any word reaching into the outer two rows would have smashed into Scrabble's 15x15 wall. 3. But those are just little boosts. The fundamental difference is that, in Keyword, you only score points for the main word you form. Ending on a bit of fluff, do you know how the 5-point Keyword tile came about? I wasn't there, but I'll bet I can tell you. Because if Parker Brothers had gone with the simple and obvious 1 point per tile (scoring 2, 5 and 10 on the premium squares) the puny, double-digit game scores would look so pathetic compared to Scrabble that nobody would play it. And no amount of explaining that points are arbitrary, and it's the relative score that matters, would do the trick. In an early experiment with a 1-point-per-tile Scrabble variant, trying to get Scrabble off the little words, you never heard such moaning and groaning! And even a promise to multiply all the final scores by 10 didn't help! 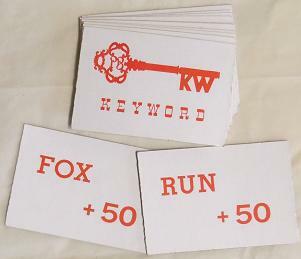 The 68 words from our first four Keyword games average about 6.0 letters in length. In four Scrabble games, you would expect about 160 words averaging about 3.5 letters.